that Michael's 'The Counselor' co-star, Brad Pitt may be preparing to finally get married to my girl crush, Angelina Jolie this weekend! According to the Daily Mail, there are massive party preparations underway at Brad and Angie's French home, Chateau Miraval, to take place this Sunday. As a red herring, this weekend also happens to be the 50th wedding anniversary of Brad's parents, and they are apparently in town. What's even more curiouser is that the jeweler who made Angie's engagement ring is among the expected guests, as is Brad's bff George Clooney. Now this begs me to inquire that naturally, as Brad is working with Michael for the third time, they are more than mere acquaintances, and since he's so close to this fancy event on Sunday in France, surely Michael would be invited to THE "wedding" event of the year of THE Hollywood couple. If there is to be a wedding, and if Michael goes... would he go solo, or with his mum, gf, or bff? And of course Sir Ridley Scott would have to be invited, after all, he gave Brad his big break back in 1991 with 'Thelma and Louise'. But who knows... we surely won't know anything until just before or after the "wedding" takes place. I hope they get married this weekend, it's kinda boring right now in the gossip department of celebrities I give a damn about. I love both Brad and Angie, so, I'm hoping this is what's cooking instead of a fancy 50th anniversary for Brad's parents. As of right now, there is no other fresh news on Michael other than him filming The Counselor in London. And it gave me pause to think about the Michael fan base. When it's quiet, like no filming gossip or new pictures of him, sometimes it's as if the fans evaporate. Why is that? Why do visits to FF decrease significantly? Do some fans only have a passing interest in Michael in that there has to be something constantly new to keep their interest in him? He's been on the scene long enough that people know about him now, but it's as if only when the mainstream media (MSM) have something to say about him, people are like suddenly reminded about Michael and only then do they come visit FF or other fan sites. I notice a significant spike in visits to FF only when the following occur: a) narly gossip, b) msm article, c) new pictures, d) interviews, and e) film premiere/movie released. During the moments in between each of these occurrences, the level of readership goes back down to the 'truly devoted' levels. I'm sure this is how it is with all celebrities, with the exception of a few, like Brad and Angelina, where people are constantly talking/writing about them and looking for info on them. I guess what I want to see for FF and Michael is to see a sincere, steady growing interest in him, real fans genuinely interested in following his career, even when it's quiet. Like the girls at Pinterest, God Bless them... especially when it's quiet, that's when they kick even more into gear to post pictures of Michael and relevant image themes to keep themselves and others interested. Basically, they are not there just to post the brand spankin' new pictures, they post images of him that we have seen before, but the comment options allow for new engagement between the fans to keep the momentum going. I guess that's what I want for FF... to see a steady interested momentum... not just peaks and spikes in visits that correlate to new images, interviews, gossip, and premieres. There's much more to being a fan of Michael, and being Michael Fassbender, than to just sit and wait for the MSM gossip machine to spoon feed new info to remind people that he exists. My best wishes to Angelina & Brad i hope they will have one of those rare marriages that last forever. I literally check your site every day - & thank you for your post today as it made me know I'm not a fair-weather fan. I actually work less than 5 minutes from Liverpool street in London where I read they were filming the other day... Keep hoping for a sighting but no luck yet!! @cellardoor: wow, I hope you'll be lucky and see him! Although I sense I'd be a massive dweeb & probably just turn into a puddle of swoon!! I didn't know about the rumor of them getting married this weekend. Wow that will be something, if so I hope we see Fass in a tux! Simone, thank you, for your thoughtful analysis of the ebbing tides of fandom---Michael’s, and in general. As always, you provide all of us with an interesting, intelligent platform for discussion, one we are---lets face it---pretty blessed as a fandom to have...not all fandoms are lucky to have such a place to go, to interact and share. I think the inherent value in the years of hard work you have put into developing FF is just that: the forum you provide. More so than the news, the updates, the article links and the pictures you graciously share with us, the open forum you provide is invaluable to Michael’s fans. If we don’t say that enough, please know that we feel it. You have crafted FF into a lovely place to visit, and the labor of your love is much apparent to your followers. @Katie: there are so many ways of being a "fan" (like there are many ways of being a mother, or everything else in life). I never liked this word, "fan". As far as I am concerned, I recognized a double of my own soul in Brandon (a "lonely soul", to quote the song of Assassin's Creed!). kt, thank you for taking the time to share your eloquent and supportive thoughts about Fassinating Fassbender. Allow me to preface that my analysis should in no way be personalized by any one person who themselves know that they are one of the many quiet dedicated to visit this blog regularly. I was just speaking on a qualitative level in writing about the unique visits this blog receives on average, versus days when there is heavy MSM news on Michael. I am aware that people who have never ever posted here in the nearly four years of FF, come here regularly to lurk and read. I consider those unknown persons as one of the many 'devoted' people who read FF, regardless. So there's no need for explanations of why a particular person cannot visit daily or post often, that is not at question - so I hope you understand this, my comments where not directed at anyone in particular. As the founder of this blog, yes, by inherent nature, I must see to this blog daily, if just to observe to make sure the board is operating and to have a quick look around. And because I have a very active life, I do value really slow news time periods so that I can have a breather and focus more intently on other things. I never realized how much I have on my personal plate until this summer, and yet I still give 100% to FF. I do not expect the same level of dedication to FF, that's impossible, so when I see X number of avg visits a day, I know in my heart, those are the unknown devoted and that they trust coming here to see what's up. So again, thanks for your thoughtful feedback kt, and know that I perfectly understand where you and others like you come from, and I appreciate that. A French article reports that the wedding would probably take place on August, 18????? I am not going to repeat what has been said before. Katie I like your way of putting things and I agree with you. I also agree with Emilie about the word "fan" which bears "pejorative" connotation for me (and that's only my personal opinion and perception of things). And finally - and most importantly I think - the fact that we can discuss things on the blog is really a valuable asset, and now I can confess that I was a quiet reader (rather than fan lol!) for a while before doing my "coming out" and I'm glad I did it and virtually met you. Yet I'll still be quite quiet because my professional/personal life takes a LOT of my time and I literally do not have time sometimes (& sometimes for weeks). Yet again, and finally, I am appreciative and very grateful to you Simone and Emilie, Dionne & Veronica of all the hard work you do to keep this blog afloat and to give us this platform of information and discussion - as I could never have the time to do that. So thanks. Very well put. 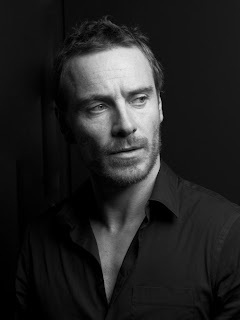 I love me so Fassbender anyday wooo! And if Brad and Angelina are going to get married, well bless the hell out of them. Huzzah! Dude, Fassy be on my mind and this site helps so much. I have plantar fascitis in my left foot and i say I have Fassyitis instead to deal with the minor pain sometimes. WOOO. I tell you, hmm, that boy is fine and he be actin and tell people about him all the time. He ain't your normal run of the block actor, he's an artist beautifully bringing out the action of words of on script. He's just damn good. I am locked and loaded. In it for the long haul. I know we have only scratched the surface of his presence on screen. And that in itself, makes it so exciting. Thank you to the staff of FF for keeping Michael lifted up to the viewing public. Well welcome to Fassinating Fassbender Petra! New fans bring a new level of excitement and enthusiasm. We look forward to seeing more of your comments. Thanks! Thanks Simone its great to be part of a wonderful group. Well, according to Blind Gossip Brangelina will get married this coming weekend.